Perfect secluded ,very private Villa with own pool Sea and mountain views. We are almost fully booked for 2019 we are taking bookings for 2020!!!! Villa Sahin provides a perfect retreat with excellent facilities. Relax and enjoy the tranquillity and peaceful surroundings our villa offers. Air conditioned throughout plus a private fresh water pool, the villa over looks the Taurus mountains and the coast line of the famous Patara beach. Our location is set in the rural village of Uzumlu just a short drive away from Kalkan. Untouched by tourism, this holiday experience will give you an insight into real Turkish culture. The unspoilt originality of Uzumlu is what gives it such magical charm. Relax and unwind in this secret retreat. Our Villa is set in beautiful Mediterranean gardens with flowers, grape vines , olive , pomegranate and fig trees. A romantic setting for couples and perfect for family holidays. For guests looking for total privacy our pool area is totally secluded. Staying at Villa Sahin can be any holiday you want it to be. If you are looking for a haven of peace then you can lock yourselves away, swim , sunbath, read, relax and enjoy! If sightseeing and exploring and discovery is more your thing there are so many tourist attractions to visit within easy reach of Villa Sahin. Uzumlu is very popular for hiking or you can hire quad bikes from Kalkan and drive up to discover the mountains views. If you fancy a day at the beach there are three to choose from all within a 15 to 20 minute drive away. Uzumlu Pide is a 5 minute walk from the villa where you can order pizzas and various snacks to eat in or take away. There are also a couple of local restaurants that serve traditional Turkish breakfast, lunches and dinner. Definitely worth a visit. Local shops for all your essentials are also just down the road. Stunning location with amazing views. 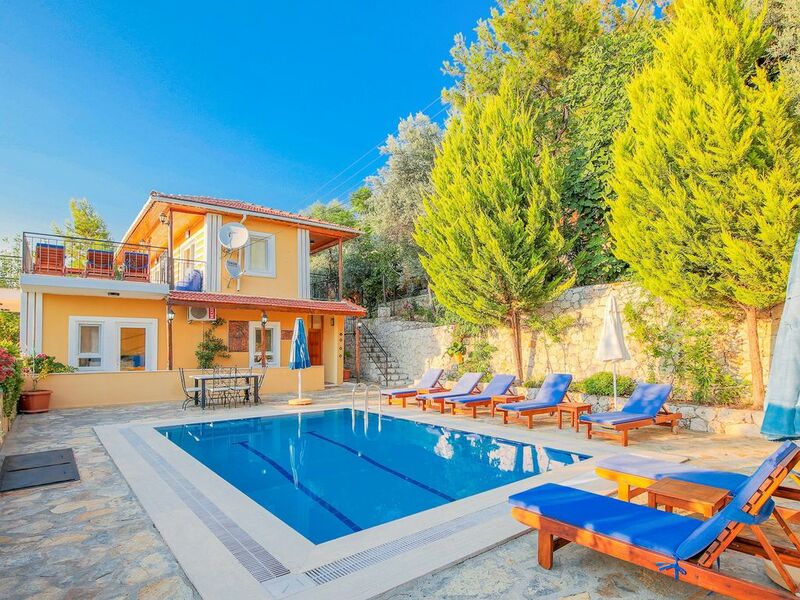 Close to Kalkan and a perfect base for sightseeing and visiting popular tourist attractions. Peaceful retreat in a natural environment. Fresh water pool with secluded pool not over looked. Large modern bathroom with shower unit, sink and toilet with bidet. Bathroom 2 has shower sink unit and toilet with bidet. Large table and chairs in Kitchen seats 8. Also dinning table on main terrace to eat outside. Sea Kayaking at Kekova This is a great way to see the sunken city of Kekova and experience sea kayaking. Kalkan Boat Trip Chill on a relaxing day trip around the bays and islands of Kalkan, lunch is served onboard. Plenty of swimming and lots of fun. Private outdoor pool (fresh mountain water) Very secluded for sunbathers not wishing to be seen or overlooked. Villa sahin will receive a full clean prior to your arrival and receive additional cleans and linen/towel change 7 days thereafter. Swimming pool and garden areas are maintained on a daily basis by maintenance staff. Wi-Fi is included complimentary. Air-conditioning is included in villa rental price. Electricity is included in villa rental price. Pool towels are included for use at Villa sahin (not to be used for beach towels) Airport transfers are not included in villa rental charge but can be arranged; payable locally by guest direct to airport transfer company during your holiday. Transfers from airport can be arranged and also car hire if you require. Transfer time is around 1 hour and 30 minutes. Guests will be met at the villa on arrival and shown around we will then handover keys for you to enjoy your holiday. Flight to Dalaman are available from all uk airports. You can also fly into Antalya airport however transfer time would be longer. This is our third visit to kalkan and by far the best villa we have ever stayed in. The owners Mehmet & Donna were helpful from start of our journey, answering all our queries and making the whole experience smooth and comfortable. The villa itself was well maintained and in a very private area which makes you feel your in a luxury hidden spot. However not to far away from the villa you have an amazing pide restaurant and uzumulir market which had all our essentials for the week. Husein the shop keeper was always helpful. The highlight of the villa was the stunning views from the balcony. We were also given a generous welcome package which we really appreciated. Thank you so much for this fantastic review. We ar so pleased that you enjoyed your stay at our Villa. Such lovely comments. We look forward to hearing from again in the future for your next visit. Traumhafte Lage in einer wunderschönen Natur oberhalb von Kalkan/Kas! Mitten im grünen und stillen liegt diese sehr schöne und grosszügige Villa mit einem einmaligen Blick ins Tal und aufs Meer! Mobiliar ist anspruchsvoll und neuwertig, es ist genügend Platz bis zu 9/10 Personen.....voll ausgestattet und wirklich sehr SAUBER! Das Dorf Üzümlü ist auch sehr schön, vorallem hat man alles was man für den täglichen Bedarf braucht....kleiner Supermarkt, Friseur (empfehlenswert und günstig), leckere Restaurant usw.....die Menschen dort sind sehr nett und aufgechlossen, man muss absolut keine Scheu haben!! Sonnengarantie bis in den November rein! Das geniale an der Villa, abgesehen vom Ambiente, ist die Lage..........man ist in ca 15 min an den schönsten Stränden Türkei´s, Kaputas und Patara, diese sind wirklich sehr schön. In ca 8-10 min ist man in Kalkan wo man alles bekommen kann usn natürlich auch schöne Strände hat. In 40 min ist man in Kas und in 1 Stunde in Fethiye/Ölüdeniz, 18km entfernt ist der Canyon "Saklikent" (atemberaubend). Die Betreuung findet durch die unmittelbaren Nachbarn statt, Hüseyin und Emine, die ausserordentlich nett und gastfreundlich und rund um die Uhr erreichbar sind. Villa Sahin ist ohne Einschränkungen 100 % empfehlenswert. Danke an Donna und Mehmet für diesen sehr schönen, erholsamen Urlaub in eurer wundervollen Villa! Thank you once again for a fabulous review. We are so pleased you enjoyed your stay and found the Villa so clean and tidy. We are lucky to have Hussain and Emine to look after the villa, all our guests are giving such great feedback. We look forward to hearing from nearer to your holiday next year. Thank you for your lovely review!! we are so pleased you had such a lovely stress free holiday and found everything you needed at the villa. It was nice chatting to you during your booking and we hope to hear from you one day again in the future, for a return visit to Villa Sahin. Please be sure to recommend us to your family and friends. Take care. Have just arrived home from a week at Villa Sahin in Uzumlu, Kalkan. The arrangements beforehand with Mehmet and Donna were just brilliant and we had no cares or issues when setting off, even our transfers to the villa and car hire whilst in the area were arranged via Mehmet. The villa is well appointed, air conditioned, modern and very comfortable with all amentities including free wi-fi, and set in a beautiful mountain village with fabulous views. It was like stepping back in time to an age of unrushed, unfettered peace and the surroundings just let the relaxation come naturally. The owners family, Hussein, his wife and lovely son were just superb and nothing was too much trouble for them in helping us settle in. We were even brought home cooked Turkish food to trying a number of occasions, which was delicious and incredibly thoughtful and kind. We shopped locally with another Hussein in the village who was so helpful to making sure we had what we needed. The Pide shop in the village is a must try with delicious food at a fraction of cost, we fed four of us for 50TL = £12.50 and there was plenty to spare. The local barber, Sulieman, is a must visit too for a Turkish shave. I was pampered for 40 minutes and he only wanted 4TL = £1.00!! Modesty put to one side, I refused to pay this and gave him 20TL = only £5.00 and it was worth every penny!! Trips into Kalkan only took 15 minutes and the beaches at Kaputas and Patara made for excellent days out. Having tea, coffee, sugar, a welcome pack full of delicious goodies, washing powder and dishwasher tablets provided is something we had never experienced before and it epitomises the way Uzumlu makes you feel, no one trying to eek every penny out of you. We will certainly be going back, not something we often say. we are so pleased you enjoyed your holiday and had such a lovely time. We are glad that you found everything you needed and was happy with the provisions we left for you to enjoy. We love to hear that people would like to return, it reassures us that we are getting it right and we will continue to do so. The barber experience is certainly one to remember and so cheap!! we look forward to hearing from you in the future and trust that you will recommend us to family and friends. Kalkan has lots of tour operators where you can book excursions, so many to mention but we recommend day trip to Meis Greek island. Jeep safari, quad bike tour at Patara beach, water sports, kekova sunken city boat trip and Saklikent Gorge. There are many boats in Kalkan that offer day trips a must for a fantastic experience, available to book with the captains along the harbour. Kalkan market is every Thursday to get some excellent bargains and test your bartering skills! Book a Turkish bath and massage so relaxing and such good prices and plenty of spas to choose from. Maximum occupancy is 8 persons. Booking, terms and conditions A non-refundable deposit of 25% of the total rental fee is required upon booking. The balance is payable no later than 8 weeks before departure. We reserve the right to re-advertise dates if we do not receive the final payment by the due date. Payments by Credit Card (Visa/MasterCard/AMEX) You can 'Book Now' or send a message to 'Place A Hold' Villa sahin for 48 hours while you decide. You will need to arrange your own flights and holiday/travel insurance. Important note: Entry Visa – A valid visa is required when entering Turkey. Changeover Day: Flexible although dependent on dates already reserved. Rental Rates include all local taxes, utility bills and final cleaning. No additional fees to pay when you leave. Rental durations less than 7 days considered if it fills a gap.